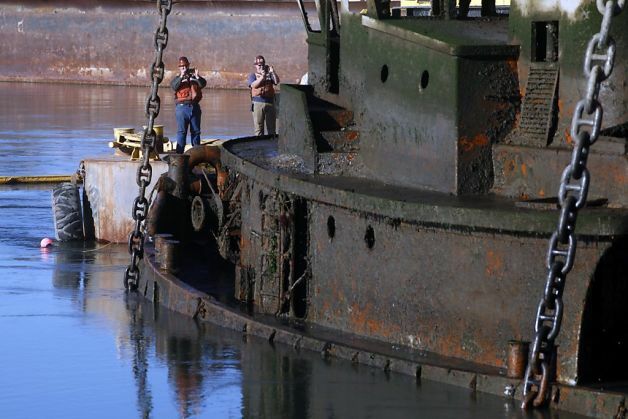 The U.S. Environmental Protection Agency has launched a two month long project to remove 40 abandoned vessels in the Oakland Estuary. The bottom of the estuary if full of marine debris, sunken vessels and toxic materials. 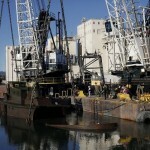 Contractors has raised the 105 foot long tugboat Captain Al near Alameda, California. 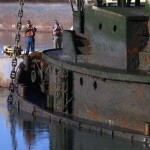 The Captain Al had been sunk in the estuary for over 15 years when the tugboat was abandoned in the 1990s. 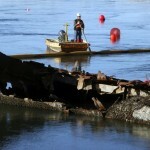 Divers pumped out sediment from the Captain Al then cranes hoisted the vessel to the surface. Reports state the project will cost around 3.5 million dollars, but some of the funds were paid by from owners of the Cosco Busan. The Cosco Busan had struck the Bay Bridge in 2007 and released over 53,000 gallons of bunker oil into the bay.